So where's the Lemon Curd and the Devon Cream?? 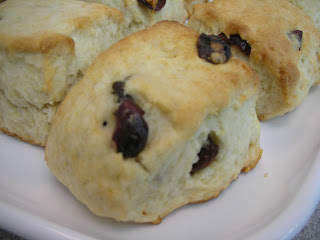 Today resembled high tea what with the offering being a plate of homemade scones. Scones are great but truth be told the penchant here in the U.S. is for them to be gigantic! 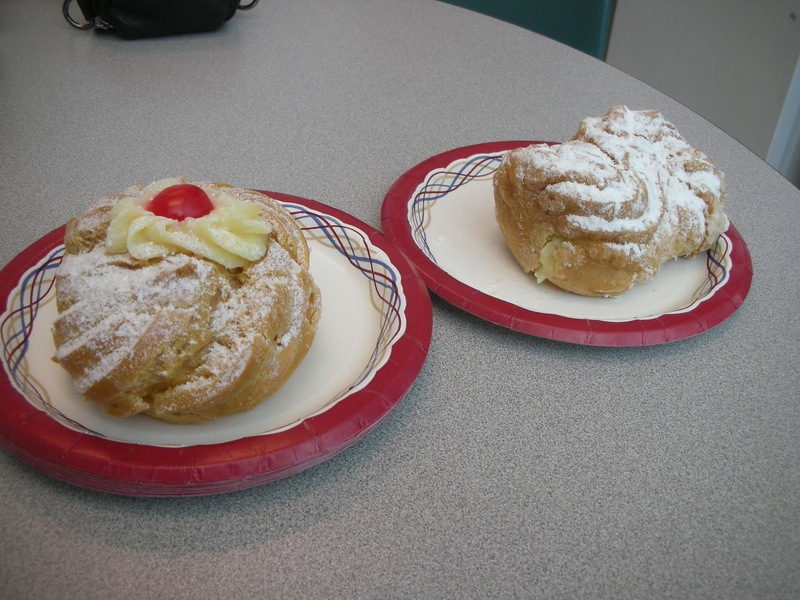 Go to most bakeries or cafes that have them and they are about the size of a shoe. 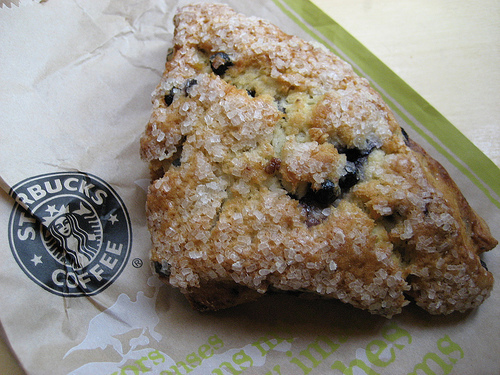 Get one of the gigundo ones at Starbuck's and you'll be full for a week. Monster Scone from Starbuck's...only 500 calories! 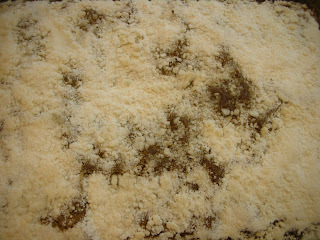 Since they are mainly flour and butter they have a tendency to be dry. Hence they lend themselves to being served with tea and during formal teas they are often served up with lemon curd, jam and Devon cream - something similar to whipped cream. In civilized circumstances they tend to be smaller and easier to consume. No lemon curd...what to do? When nothing else is around slather it with butter! Today we were civilized. 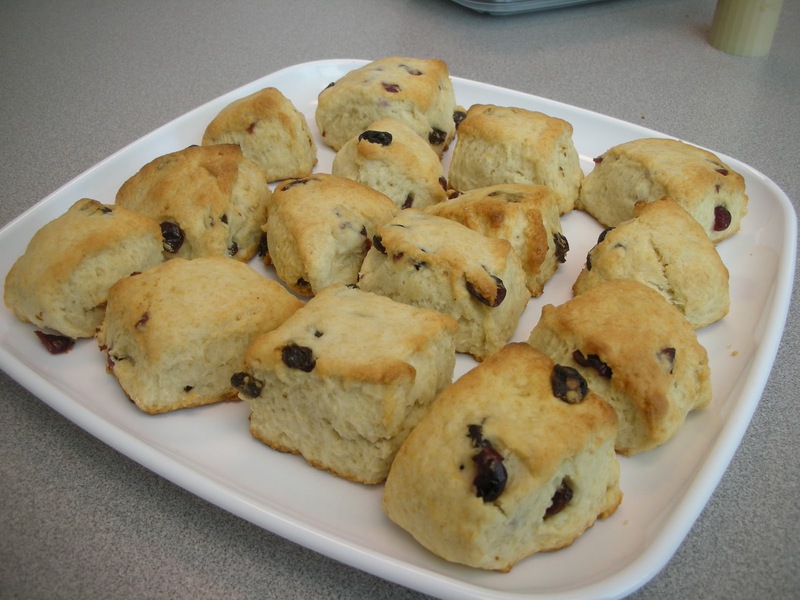 One of our patrons brought in some home made scones that were indeed the appropriate size. They were very fresh, not overly dry and tasted very good. They went will with coffee and or hot chocolate but regrettably none of the usual accompaniments were there. No lemon curd! No jam! No Devon Cream! What to do in a situation like this? We just went for the next best thing after whipped cream....butter. Scones with butter did just fine! Nobody signed up for a cake slot today. 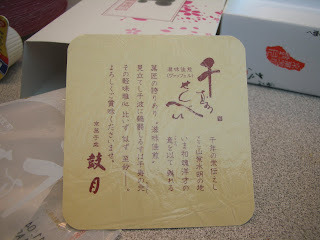 However, we were lucky in that a newly arrived colleague from Japan (the plane left right before the tsunami) had brought some Japanese sweets as a gift. 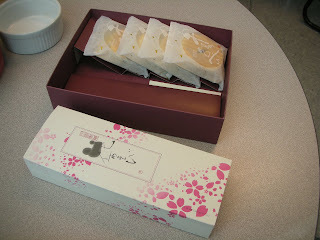 We've had several Japanese treats over the years. 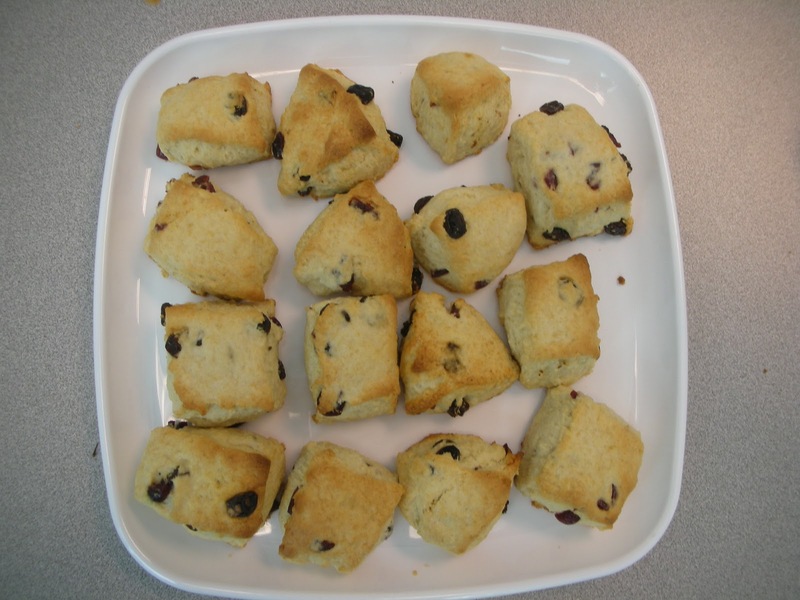 Sometimes they were cake like, sometimes they were cookie like and sometimes they were bean derived and jello like. The latter are always interesting especially when the gelatinous bean thing is in the shape of a brick and you have to slice it up. The texture can be weird but everything goes down well with tea. As usual today's offering was in a lovely box. There is one thing we have come to learn when we get these surprises from Japan - it's all about the wrapping. 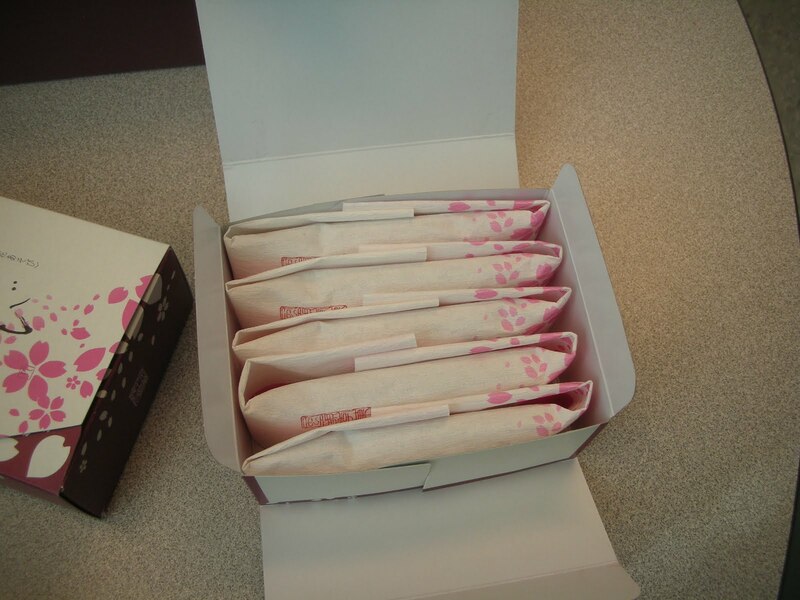 In the box were two types of things that fell into the cookie like and bean derived categories as mentioned above. 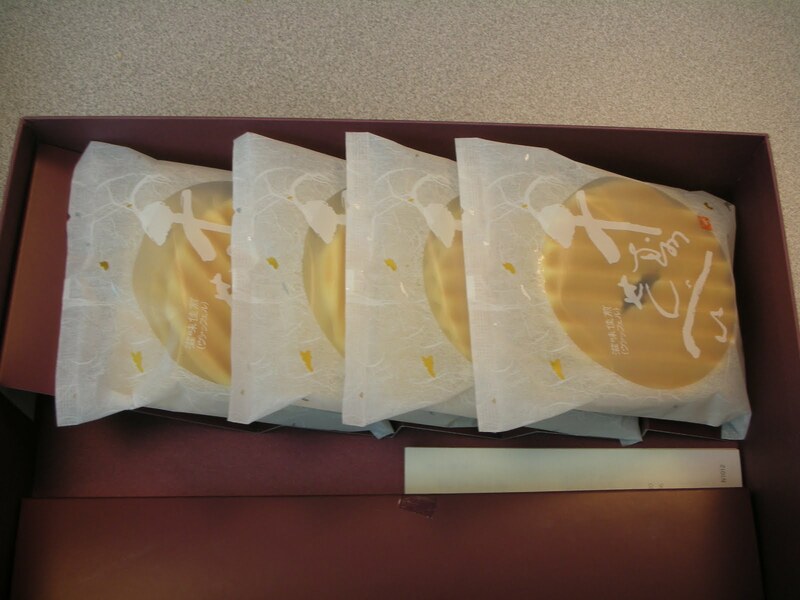 Getting to the cookies was easy enough but the penchant for extensive packaging of the product was on full display with the bean based goodie. ....and finally a plastic sleeve with the junk. There was the original box. 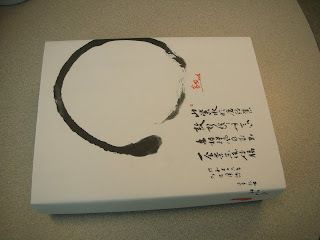 Inside that box was a sleeve. 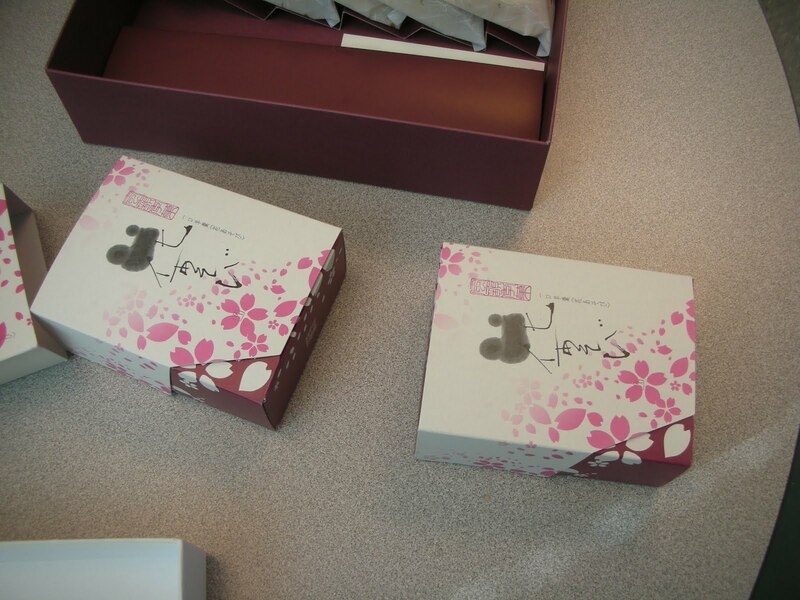 Inside the sleeve were two more boxes. Inside those boxes were five individually wrapped items. 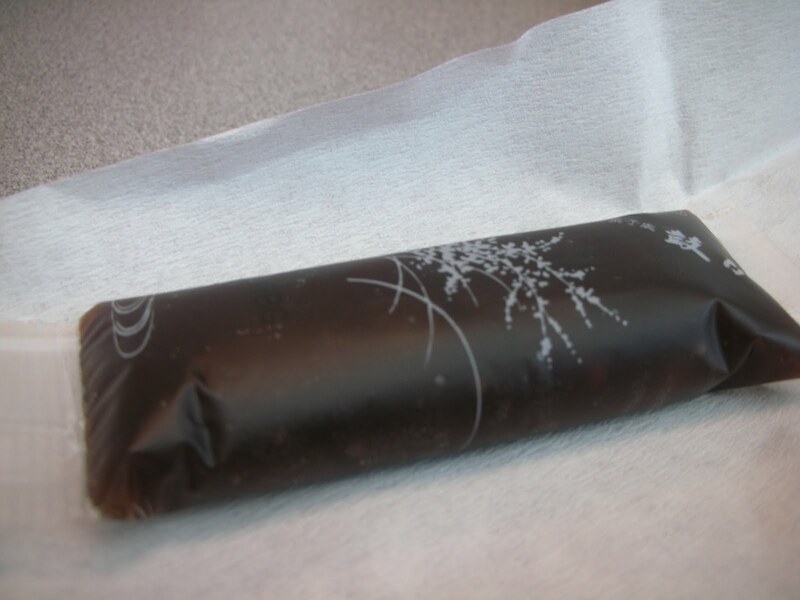 These were wrapped in a cloth like paper that was actually quite nice. 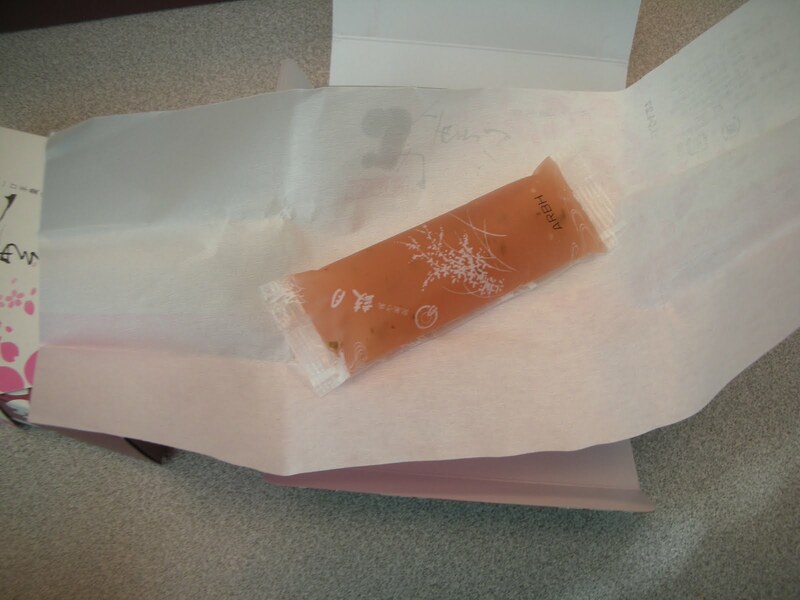 Inside the paper was a plastic wrapped mini slab of the bean treat. Remove the plastic wrapping and you finally get to the goods. If you took away most of the packaging you could probably double the amount of product. Pretty cookies all in a row! 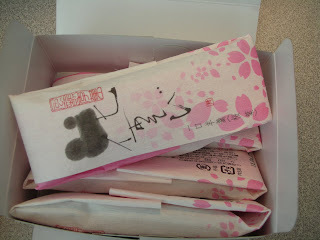 Wrapped in delicate wax paper! An artistic swipe of chocolate! Each cookie had a card in with it...no clue what it says! 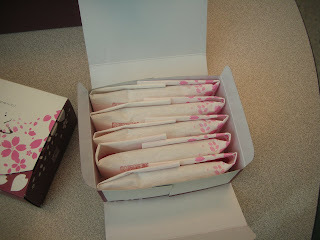 The cookies were individually wrapped with some wax paper but were laid out on a rack so that they made a nice display inside the box. 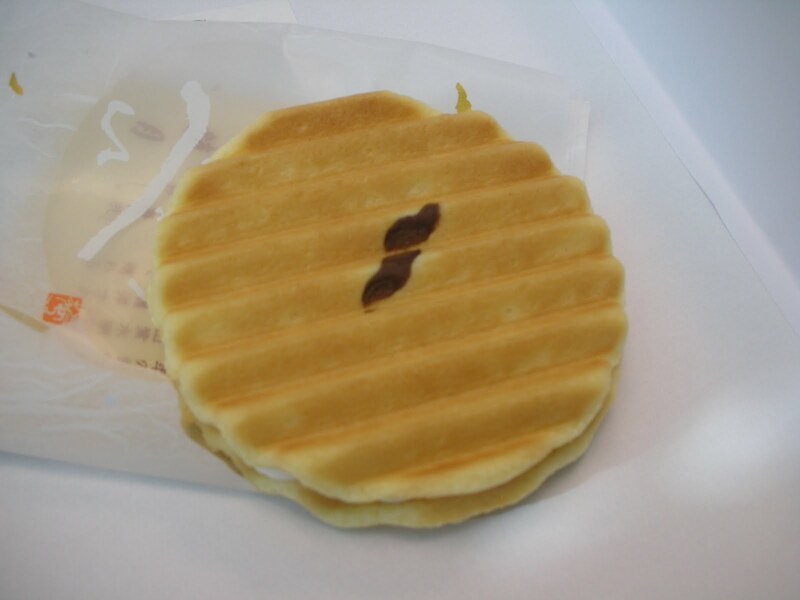 They were a wafer/waffle like sandwich with some mild cream in the center and all in all they were not outrageously sweet. A little dry perhaps but everything goes down well with tea or coffee. One flavor of bean slab! And a second slightly like a blood sausage in pretty packaging. There were two of the bean things one darker and one lighter. Each tasted vaguely of fruit but as has been the case in the past you can't really pinpoint any taste. Probably because it is derived from beans. One could argue in our conservationist times that all this packaging is wasteful. That would be missing the point. 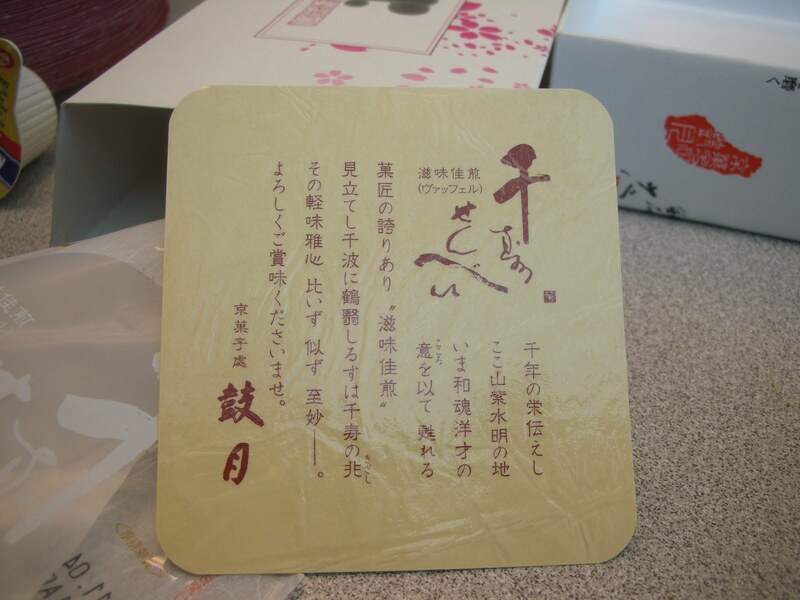 The fine packaging is as much a cultural tradition that adds a layer of beauty to things that are usually presented as gifts and there is nothing wrong with that. As a matter of fact we were able to recycle some of the material to people who thought it looked cool. So in the end it's not wasteful at all! Our ears and appetites always perk up a bit when one of our graduate students has to take a trip home to PA. What's so great about Pennsylvania? Actually there are a lot of great things about the Keystone State but to us it is the home of Grandma Miller and that's where our graduate student heads to. Not that we are presumptuous and automatically assume that some of our favorite Grandma Miller treats will make the return trip but it is a fairly safe bet. 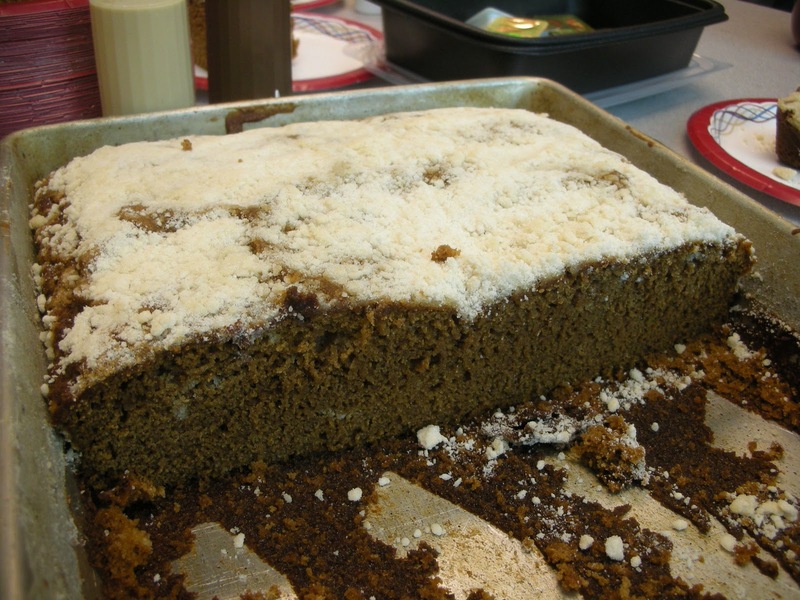 So upon return we got to enjoy - in addition to multiple loaves of banana bread spread out over about six days - the classic Grandma Miller variation of shoo fly pie...a Shoo Fly Cake! At this moment it might be helpful to digress and wonder where the name came from. 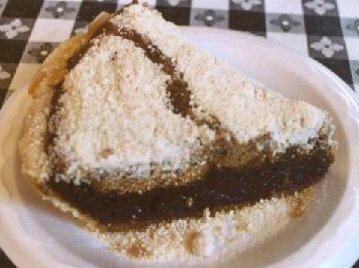 Research shows that the term "shoo-fly pie" first appeared in print in 1926. 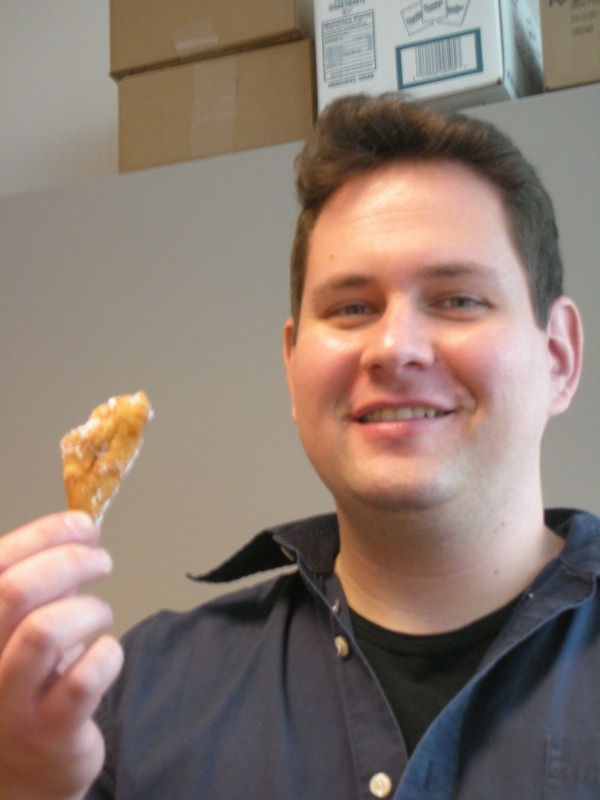 The pie may get its name because the molasses attracts flies that must be "shooed" away. It is a popular dish amongst the Pennsylvania Dutch which is probably whey we see it from the PA crowd. 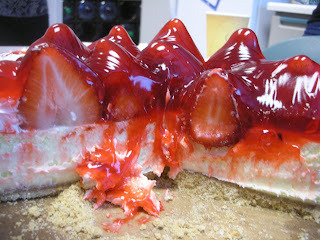 A desert of sugar on top! A nice light cake instead of that gooey pie! 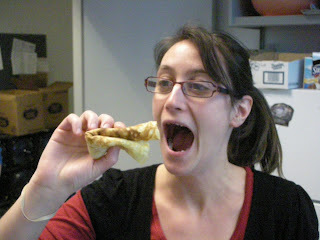 The pie is very much a pie with normally a bottom crust, a gooey molasses filling, and some sugar on top. 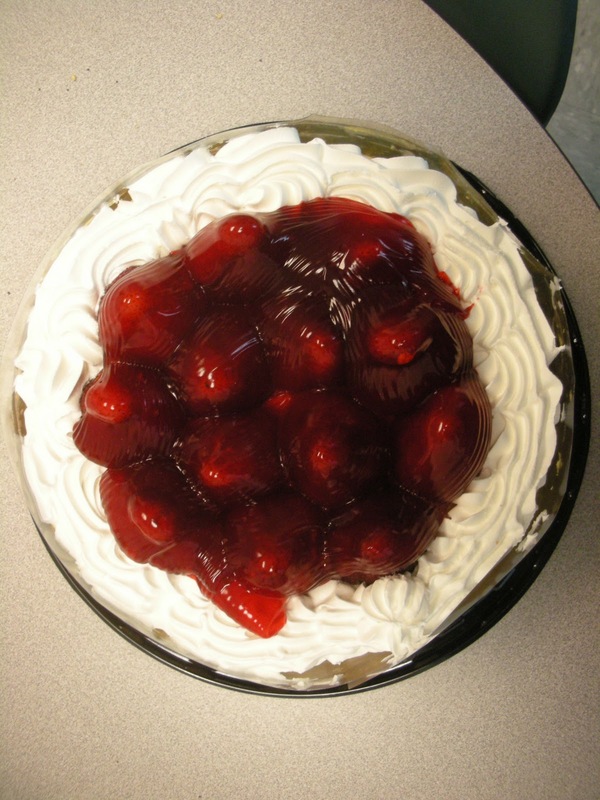 The Miller variation takes the pie and turns it into a cake. 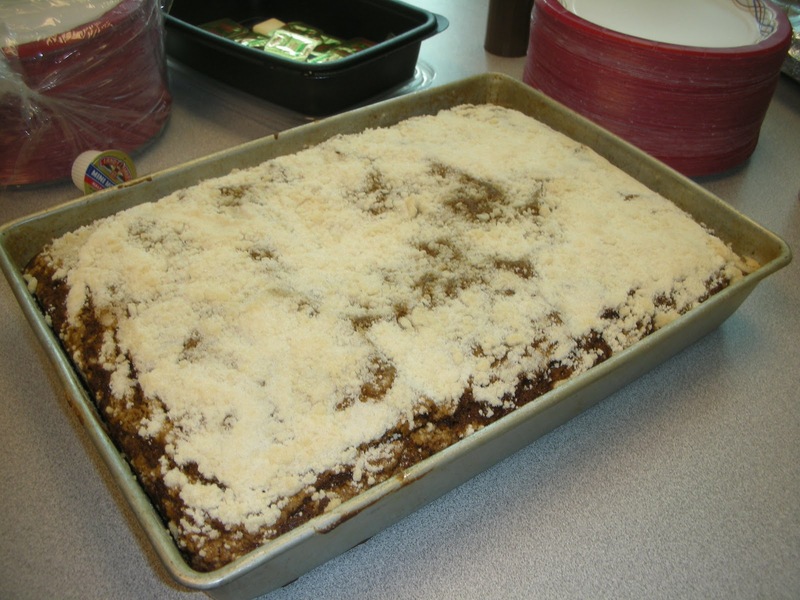 Instead of a crust and filling we get a molasses flavored cake topped with the signature sugar topping. It's lighter than the pie and again makes for a good companion to a cup of java or some tea. 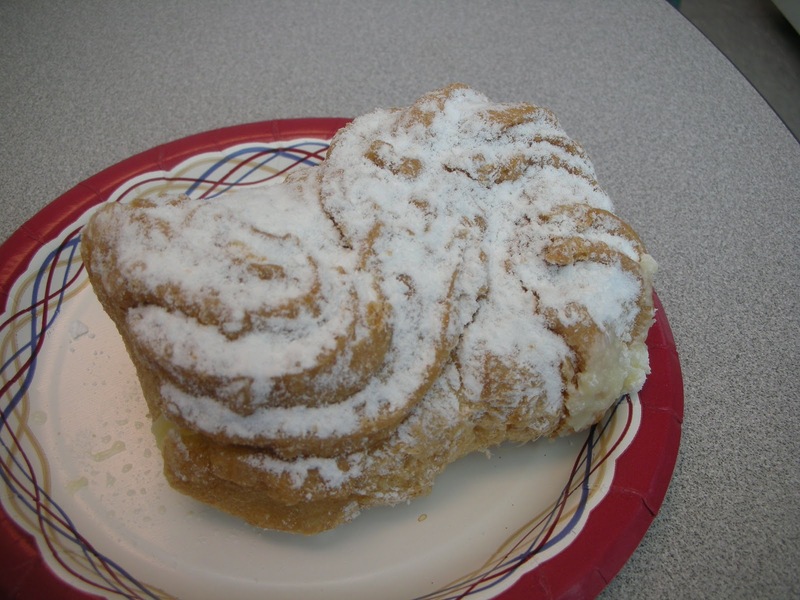 We saw some Internet pictures that include a dollop of whipped cream. Why didn't we think of that?? 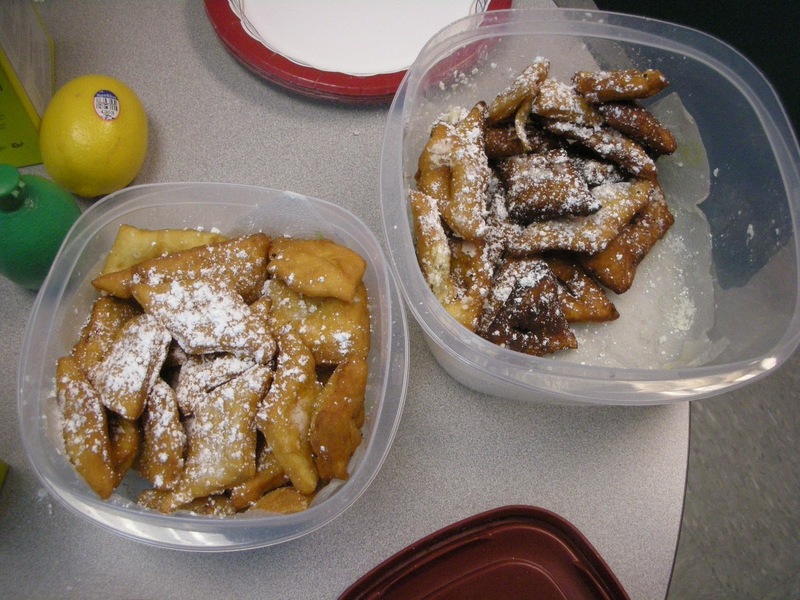 Once again Grandma Miller has demonstrated why she remains one of our favorites and we thank her once again for all that she has done for our blood sugar levels and waistlines! Today presented another concoction from Sam's Club of all places. There are quite a few here who are big fans of Sam's and we have had many a cake from the place. They all tend to be on the larger side. This one was no exception though it was not gigantic. It also was bit fancier looking for a Sam's Club entry. 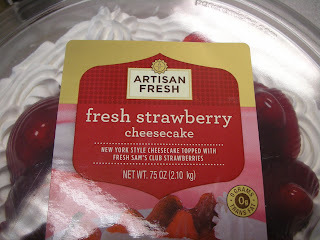 Perhaps in order to get the Artisan Fresh label it had to be a step up from the usual cake monstrosities. There was a bit of a contradiction in the use of the work fresh to describe the cake and the Sam's Club strawberries that topped it of. Inasmuch as the strawberries were still somewhat frozen we would think they should reclassify it as fresh frozen or frozen fresh to really be accurate. 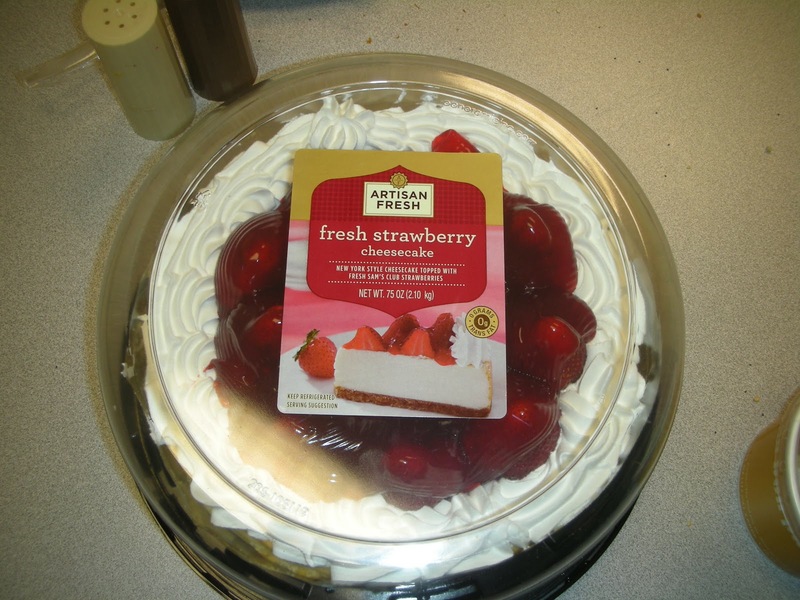 Fresh Cheesecake, fresh strawberries..so why was it frozen? Fresh, er frozen strawberries in red goo surrounded by ersatz whipped cream. Are the strawberries being consumed by the Blob? It was good, though and there were few complaints. 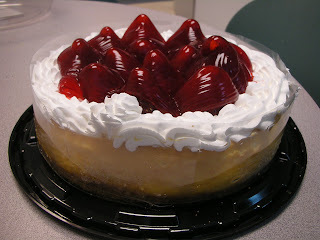 The cheesecake was solid and the strawberries, though frozen crunchy, were not overly sweetened by the reddish goo that they were covered with. (The goo kind of resembled the Blob in the 1988 remake of the famous horror movie starring Kevin Dillon.) ( http://en.wikipedia.org/wiki/The_Blob_%281988_film%29. 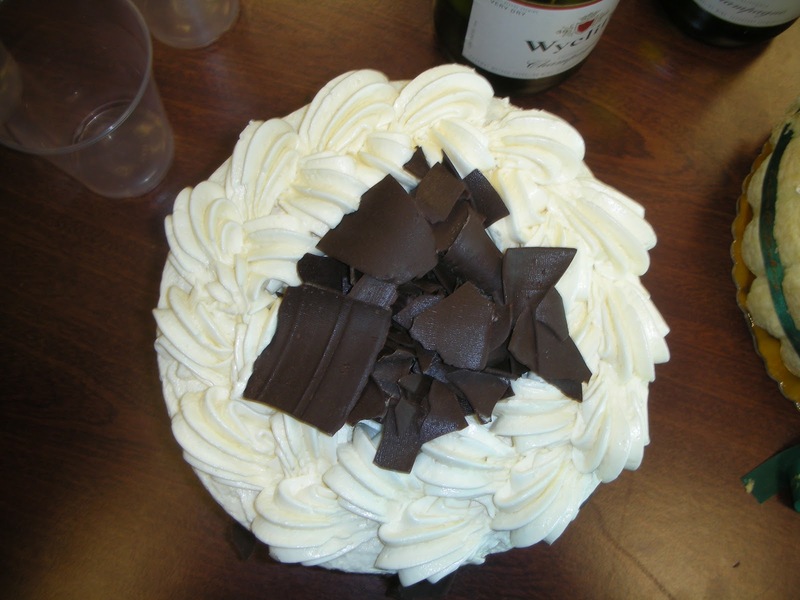 )The berries were nice and big for fruit lovers and the whipped cream added a final touch although it was not real whipped cream. 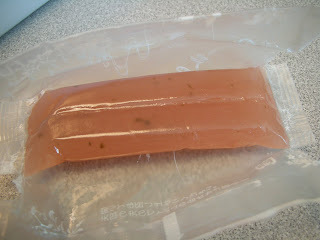 Nevertheless we'd easily eat this again should it reappear. What better than cake hour after a day of interviews! 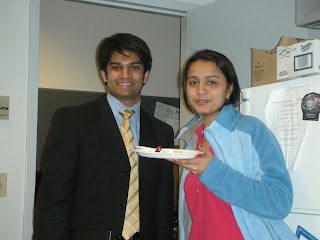 A current fellow entices a prospect with cake! 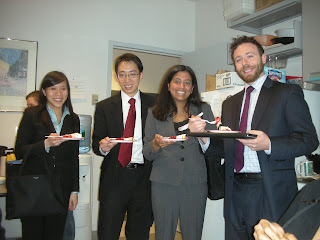 Today was the second day of interviews for future clinical fellowships in the Division. For the first time that we can remember the candidates and prospective fellows crashed cake hour and joined in for the tasting. What other institution offers this type of amenity to top off your interview day? No one! 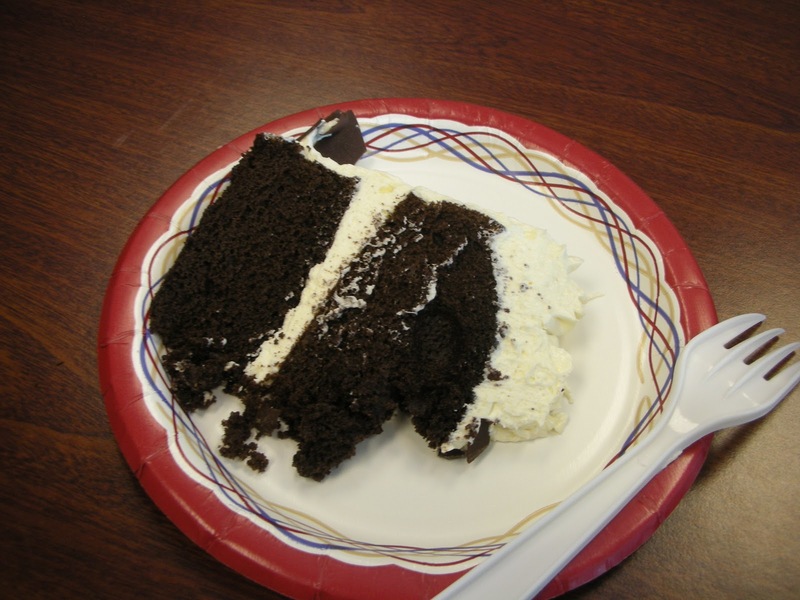 Cake hour rules! Nothing against St. Patrick but it turns out that St. Joseph's Day is two days later. 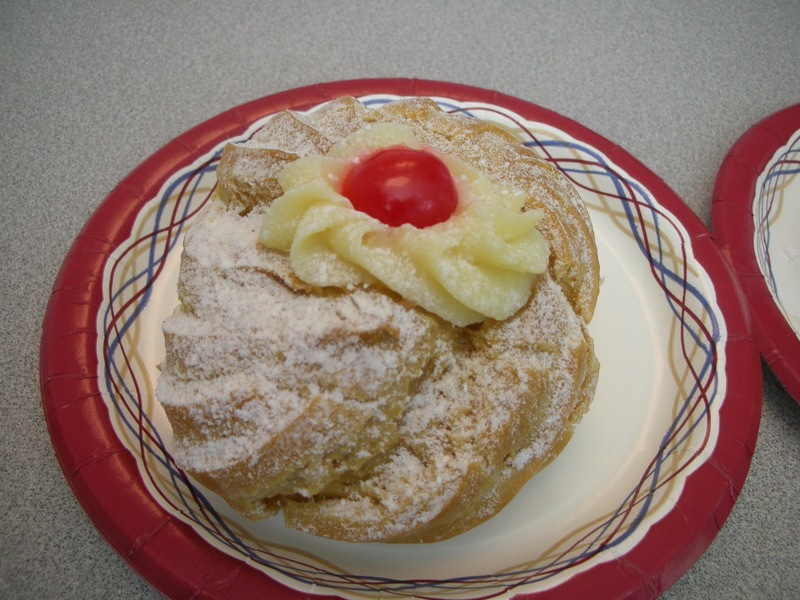 This being the case this time of year becomes the time that you can find Zeppole or St. Joseph's Day Cake. 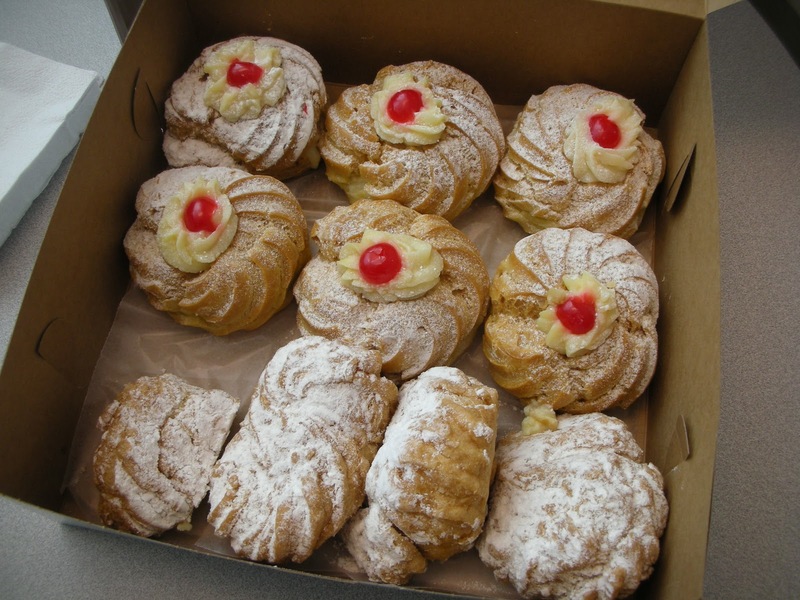 These are a custom in the south of Italy and are featured as part of the Festa di San Giuseppe. 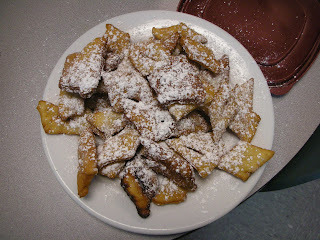 So if you choose you can celebrate St. Pat's with something they make to celebrate St. Joe! That's kind of what we did. 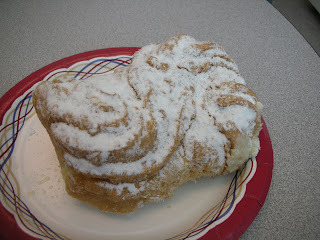 Our first taste sensation from this bakery! And this is what's in the box! We have had these before but this year they came from DeLuise bakery on Chalkstone Avenue in Providence. 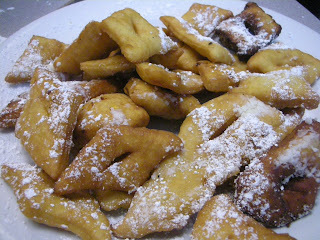 These are large puffs that are filled with pastry cream, jelly, ricotta or something similar. (Not whipped cream though because they would then be a cream puff.) In Malta they fill them with anchovies and eat them during Lent!! The Maltese preference aside, the normal sweet ones are dusted with powdered sugar and topped off with a cherry. 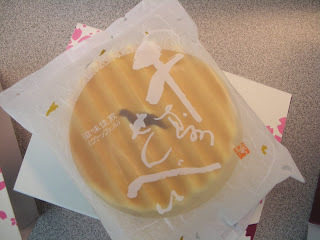 Today's offerings were filled with the traditional pastry cream and were quite large! No one attempted to finish off an entire one. (If one of our crowd had not given up this stuff for Lent she probably would have eaten a whole one.) This being said they were comparatively light given how heavy pastry cream can be. All in all they were considered preferable to the ones we had previously and everyone was satisfied even though we couldn't finish them all. Two offerings - baked and fried! The plainer version - hold the anchovies! As fate would have it tomorrow, March 19th, on St. Joseph's Day we are having a dinner of corned beef and cabbage so I guess it all evens out in the end. 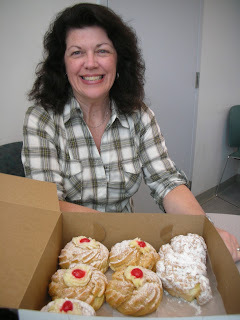 Happy St. Joseph's Day! This time its Sayonara Noda-san! 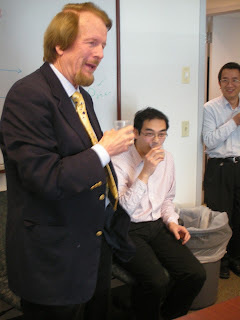 Today we combined cake hour with another going away party. Our colleague Takehiro was returning to Japan to continue his life as a clinician who may get some small chance to do research in the future. So we had a cake hour celebration of him and the work he has done which of course featured one of our Brown University makeovers. Two cakes to start with a bit of bubbly! 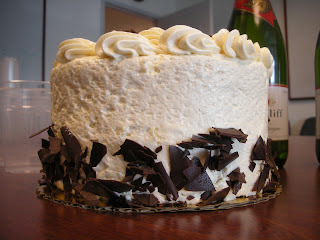 The Bailey's Irish Cream Cake. 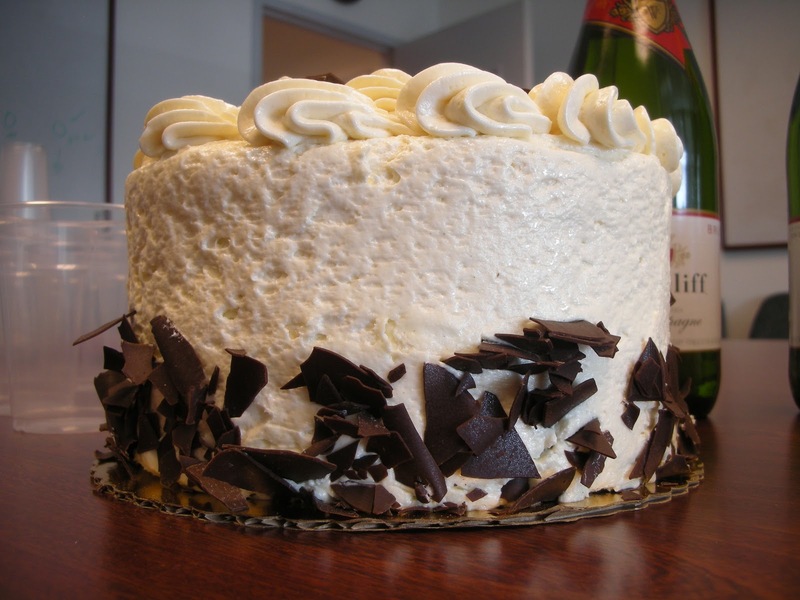 Chocolate shards on a butter cream frosting. And a skirt of chocolate to boot! 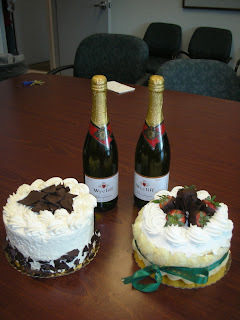 The cakes - two of them - were supplemented with a bit of bubbly to properly toast the honoree. 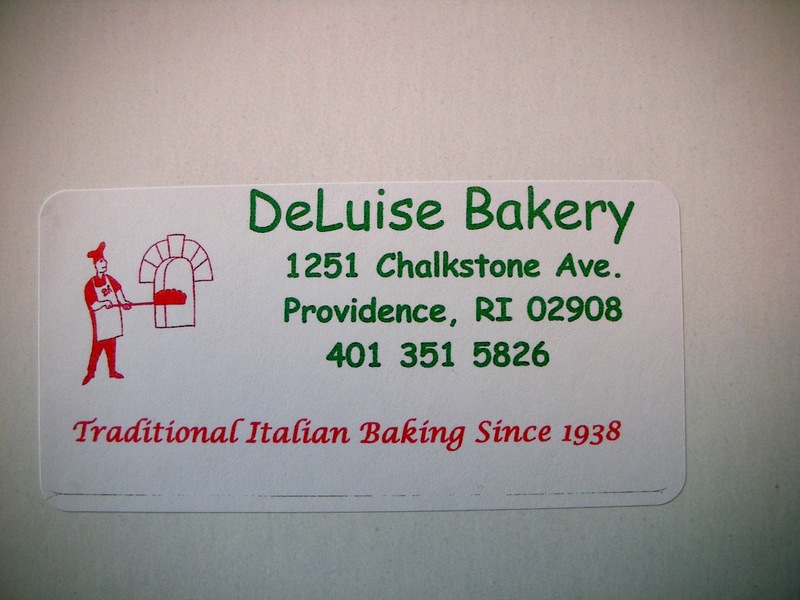 They came from the Lasalle bakery in Providence which has been featured a number of times. The two that we got were a Bailey''s Irish Cream cake and something that we think was called Cream Zabaglione or something similar. As it turned out the Bailey's Cake alone was enough go around so we ended up with a twofer - a second cake for tomorrow. 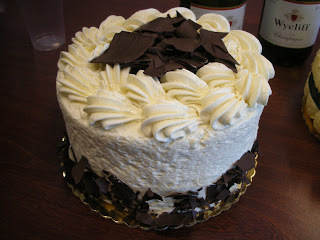 The Bailey's cake was very, very, good and is to be highly recommended! It helped that this time we took it out of refrigeration early enough so that the butter cream was nice and soft when it came time to serve it. The chocolate cake was good and fresh and all together it was scrumptious. We have no idea how much Bailey's was in it but what should it matter since it tasted good and we go to wash it down with some champagne. Stay tuned for the report on the Zabaglione or whatever on another post. I have to take this on the plane? I'm Noda, I'm Noda...you hear me, yo! 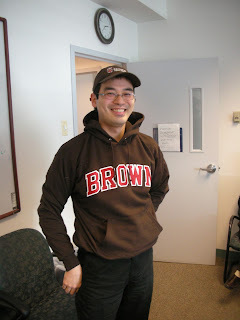 Of course we had to redo our departing colleague in Brown logo couture. 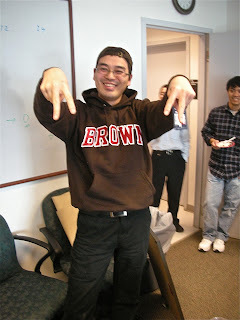 Our normally reserved friend got into the spirit of the reverse baseball cap and hoodie look as you can see. We were expecting him to break into a rap song but he didn't take it that far. 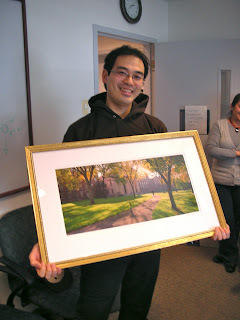 The final touch was, of course, a nice picture of the Brown campus for his future professional office. The challenge is to get it back to Japan in one piece. We do select based on the picture size being adequate for storage in the overhead bins of a transcontinental airliner! Today is not Mardi Gras in France. However we are celebrating the way the French People and also those French People in the City of Lyon celebrate Mardi Gras. Hence the title! 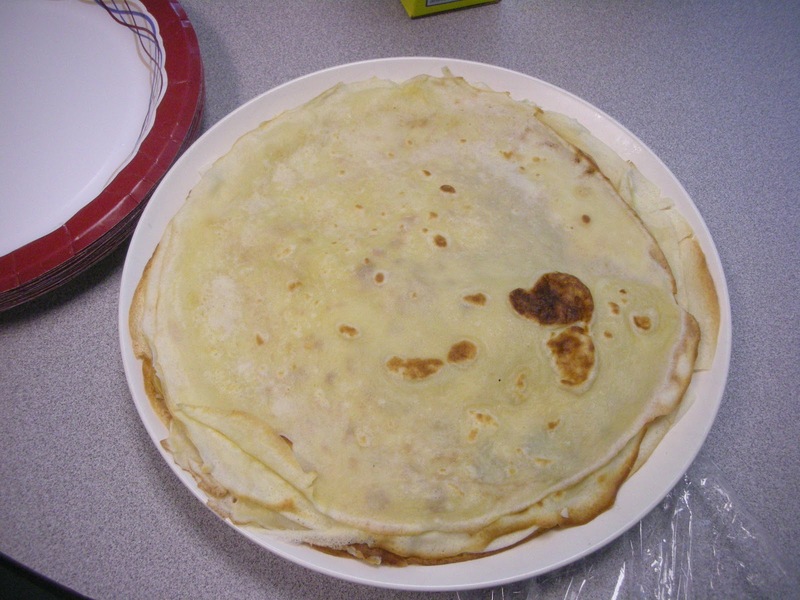 Instead of king cakes the special treat of French Mardi Gras is crêpes. 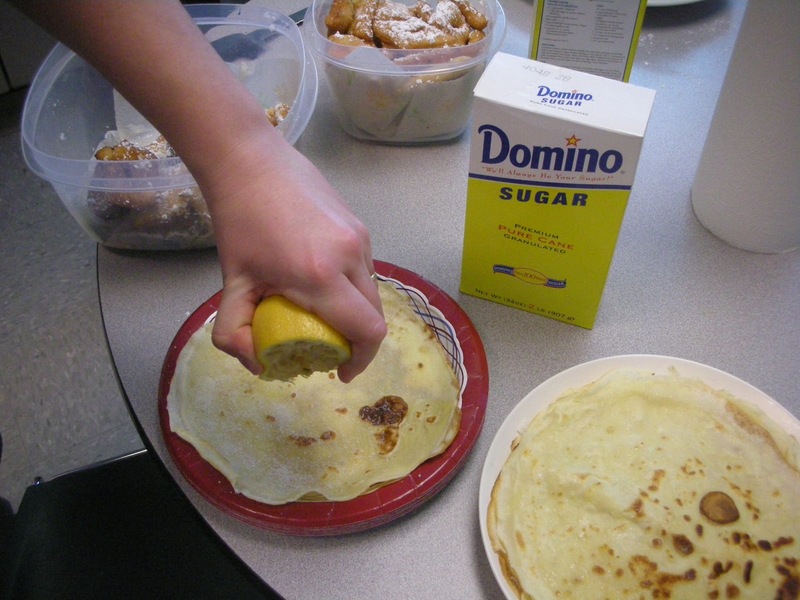 These we are of course familiar with however on French fat Tuesday they are eaten with lemon and granulated sugar. We even have a demonstration of how to appropriately prepare the crêpe by our resident French person. 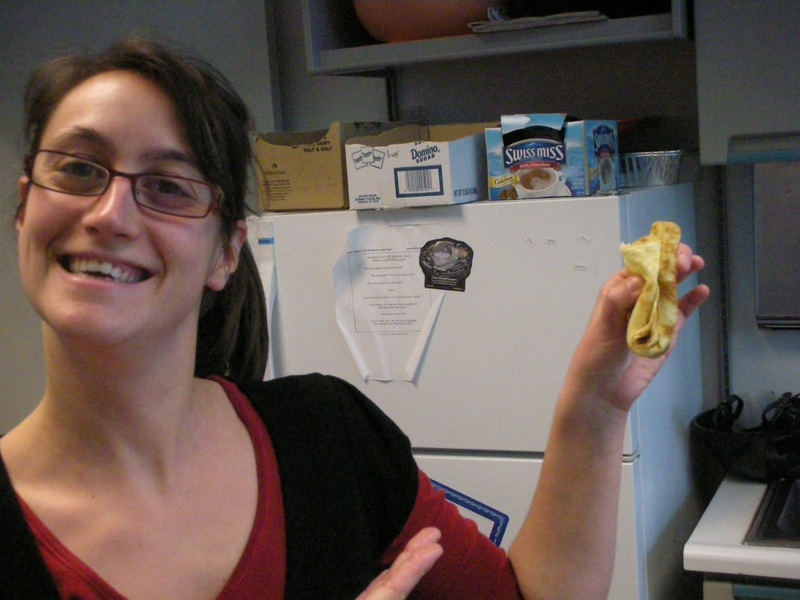 Please take note so that the next time you are able to prepare your crêpe the correct way! Les crepes que Nicolas ne mange pas! 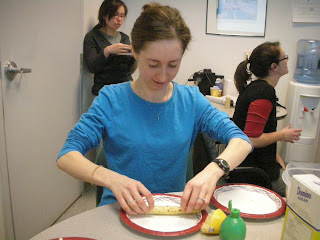 Appropriate technique for addition of lemon after the GRANULATED sugar! ....that you eat with abandon! The crêpe scene was fun as one can see but WAIT, that was not all! In the city of Lyon, the second largest in France after Paris, they partake of something more than crêpes! There the Mardi Gras specialty is bugnes. 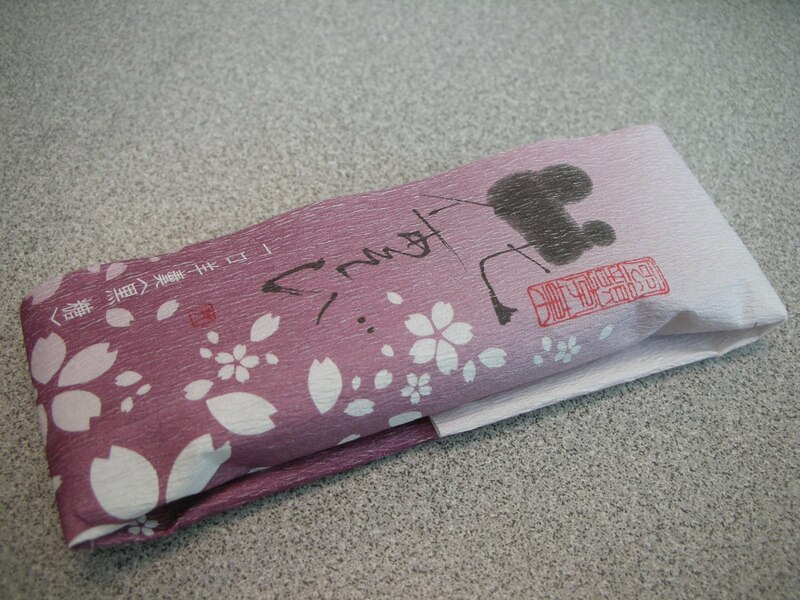 (This is pronounced boon-yeh as opposed to bug-nee as it looks in English.) 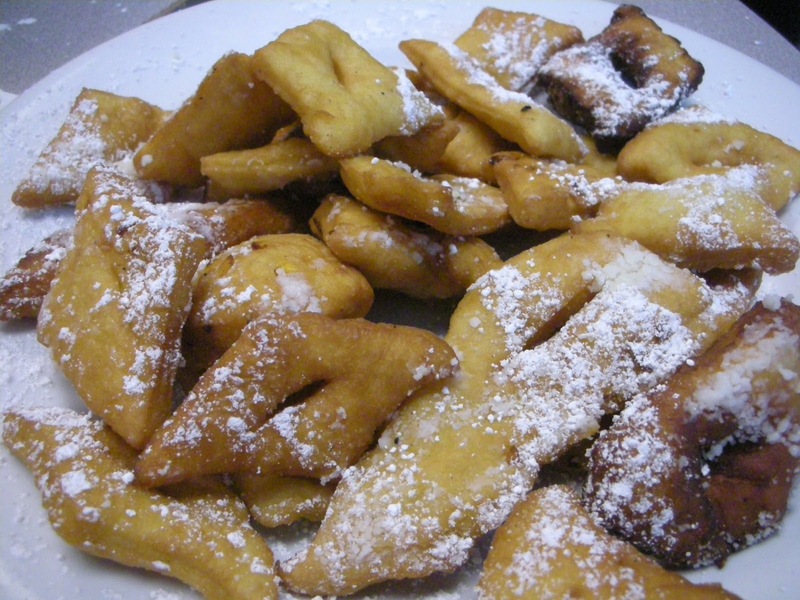 These are small pieces of dough cut into some not so specific shapes which are then very quickly fried in hot oil. We were told it is a very dangerous and risky procedure. After cooling they are sprinkled with confectioner's, as opposed to granulated, sugar and voilà ...you have a fattening dish for Fat Tuesday. Since it is very easy to eat a lot of these and risk getting fatter it is an appropriate dish to stuff yourself with prior to the self-deinal of the Lenten season. Les Lyonnais know what they are doing! Various stages of cook time browned some more than others. Random shapes with little meaning! 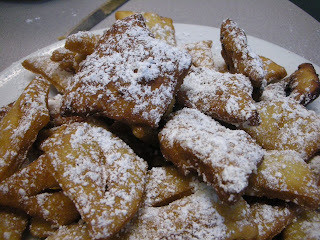 Dusted with POWDERED NOT GRANULATED sugar! 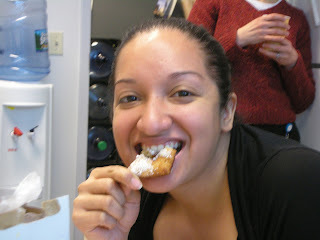 Tasty....just like a beignet only smaller! I never had one before and now I am hooked! 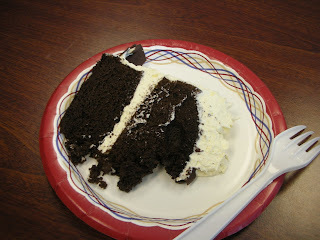 Once again cake hour fulfills its unique purpose of enlightening and educating while eating! Nothing much to Kheer about! What a cute widdle wadybug!